Rodney Earl Sanders pleaded guilty June 21 to murdering two religious sisters in their Mississippi home in 2016. What he got in return was mercy, forgiveness and a call to redemption. 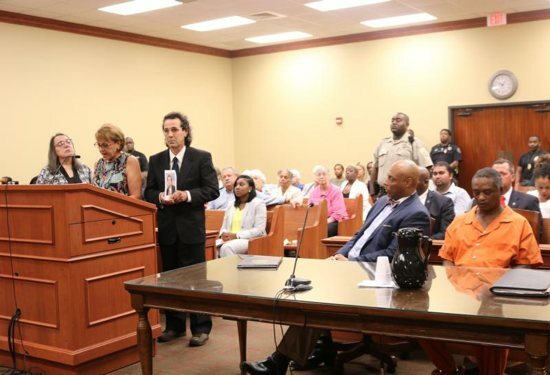 Holmes County Circuit Judge Jannie Lewis sentenced Sanders to two life sentences without the possibility of parole for the murders, 25 years for the burglary of their home and another five for stealing their car. Prosecutors could have taken the case to trial and asked for the death penalty, but those who knew the victims spoke against the death penalty from the very start of the case. Friends, family members and those touched by the lives of Sister Paula Merrill, a member of the Sisters of Charity of Nazareth in Kentucky, and Sister Margaret Held, a member of the School Sisters of St. Francis of Milwaukee, each addressed Sanders directly in the courtroom, forgiving him and inviting him to seek forgiveness and redemption. “God still has plans for you. You are loved by God,” said Rosemarie Merrill, Sister Paula’s sister. She told Sanders she prays for him, she has forgiven him and hopes he will change his life. “I hate what you did. I do not hate you,” said Merrill. Sister Mary Gatz, president of the Sisters of Charity of Nazareth, spoke of how their community came to a place of forgiveness in the days after the murders. “It was hard to believe at the time, and still is, that these two women, (religious) sisters and best friends, who spent decades helping the needy in one of the poorest counties in Mississippi, experienced such violence and suffering,” Sister Gatz said. “To this day we continue to ask ourselves about Paula and Margaret’s last hours and minutes. How and especially why? Were they afraid? Did they defend or comfort one another? Did they beg for mercy?” she asked Sanders. She also spoke of her hopes for Sanders. He even turned to look at her when she called him by name. “We have longed for justice with regard to our two beloved sisters. And so, we support this plea agreement for life in prison without parole. It is justice that recognizes all life is valuable,” Sister Gatz continued. She closed by telling Sanders that she is confident Sister Paula and Sister Margaret are praying for him. The two women religious were nurse practitioners at the Lexington Medical Clinic, about 10 miles from the house they shared in the Durant, Mississippi. They were found dead Aug. 25, 2016, in their home. Police officers discovered the women’s bodies after co-workers called asking to check on them after they failed to report for work at the clinic. Their car was missing but found later parked on a street about a mile away. Police apprehended Sanders some days later. He was charged with two counts of capital murder, larceny and burglary in connection with the incident. A resident of Kosciusko, Mississippi, he had been temporarily living in a shed across the street from the sisters’ house. He told police he went through the back door of the sisters’ home, uninvited, and stabbed them both to death. Two years later, three women religious live in that house, serving in different ministries but carrying on the late sisters’ legacy. One of those, Sister Mary Walz, a Daughter of Charity, works as a social worker at the clinic. She spoke at the hearing about how the patients still miss the two slain sisters. Sister Margaret’s sister Sue Zuern was the last to speak. Her brother Jim Held cradled a photo of Sister Margaret, pointing it at Sanders as his sister spoke. Zuern said she was grateful Sanders pleaded guilty so the families would be spared testimony in the case. After the hearing, Sister Margaret’s sister Annette Held spoke to the media. She said the day could be considered a kind of second birthday for Sanders. “Even in an awful place like a prison, he could choose to make something good out of that. I think particularly for his step-children,” said Held, adding that she hopes something good will come of the tragedy. “I think redemption — you heard all those people saying ‘we forgive, we hope for you’ — in some ways I feel like that hearing was a blessed event that is giving this man a new opportunity if he chooses to take it,” she added.